This cheaper cut of meat is slow cooked to perfection with Moroccan spices and apricots. Bone out the leg leaving the very tough meat at the end of the knuckle on the bone. As the meat is to be cut into pieces, no great subtlety is required in taking it off the bone just try and keep the pieces as large as possible to begin with. Trim any major fat and gristle off the meat and cut into large (5x5cm/2x2in) pieces. 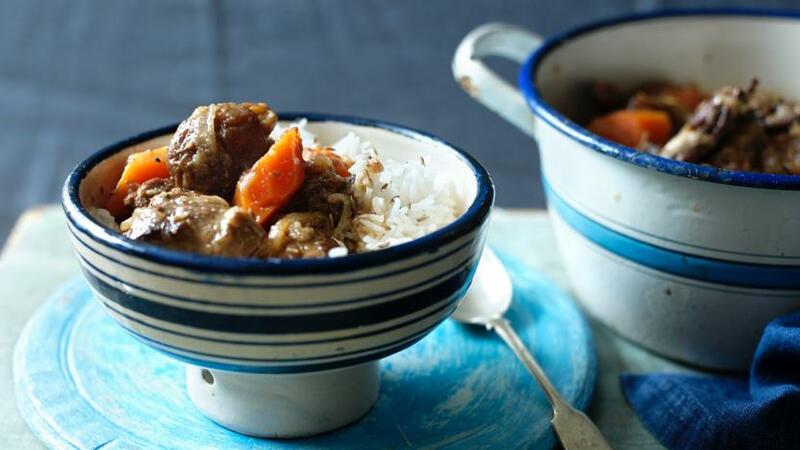 Most meat for stews is cut too small. Roast the bone and the knuckle in a hot oven for ten minutes, put in a pan with a few stock vegetables (carrots, onion, celery) and a bay leaf, bring to the boil and then simmer very gently for 1½-2 hrs. Strain the stock through a fine sieve. Rinse the apricots well in cold water then place in a bowl. Pour over enough boiling water from the kettle to barely cover them. Leave to soak for at least an hour (if you are using hunza apricots, better make it two). Heat half the oil in a large frying pan over a medium heat. Add the garlic, onion and carrot and sweat for a few minutes until softened. Add all the spices, and fry for a few more minutes. Transfer to your tagine or stockpot. Turn up the heat under the (now empty) frying pan and add the rest of the oil. Brown the meat quickly in small batches and add to the vegetables. Pour over the juice from the soaked apricots, the glass of wine, the chutney and enough stock to just (and only just) cover the meat. Bring to the boil, then reduce immediately to a very slow simmer. Cook like this, uncovered (or in a low oven with a lid on if you prefer) for 1½ hours. Add the apricots at this point (any earlier and they would get too mushy) and cook for a further ½ hour. By this time the meat should be extremely tender. Taste a bit and if in doubt cook for a little longer. Serve with boiled rice, into which you have stirred the whole cumin or caraway seeds.